A Service is held at 10.30am. every Sunday other than the 2nd. Sunday,when the group service may be hosted elsewhere in the benefice, and it alternates with Gayton Church on the third Sunday. There are occasional services at other times. Please check details on the Calendar. The Church is also used for Weddings, Baptisms & Funerals and at Christmas and all other Festival times. 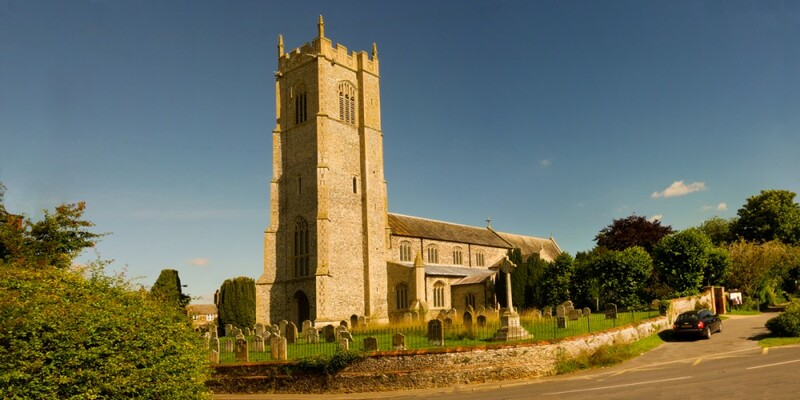 Grimston comes from a combination of an Old Scandinavian personal name ‘Grimr’, and the Old English ‘tun’ meaning ‘farmstead or estate’.The village is approximately 6 miles north east of King’s Lynn and has a population of about 2,000 in 800 or so households. 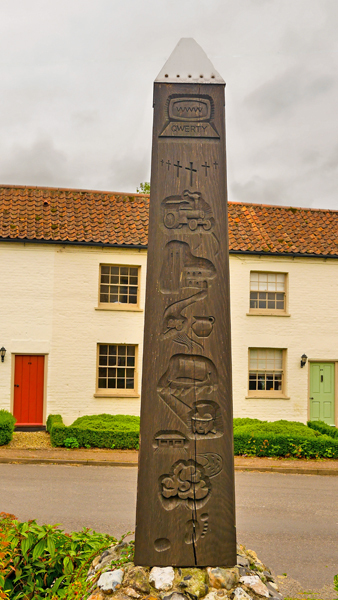 The village sign shows its history from man's first foot steps, then the Romans, Vikings, Anglo Saxons, the Industrial Age, The Great Wars and today - the Computer Age. It was built on a spring line and a Roman villa was found near Watery Lane in the late 19th century. Subsequently Roman villas were found in the neighbouring villages of Gayton Thorpe and Well Hall to the south and Congham and Appleton to the North, along the Ickneild Way. Some red bricks from the villa were re-used in the church on the buttresses and on the S. wall. Grimston’s Parish Church, on Gayton Road in the South-East corner of the built-up part of the village, is the oldest building in the village, with Saxon origins, and possibly built where there had been a Roman temple. 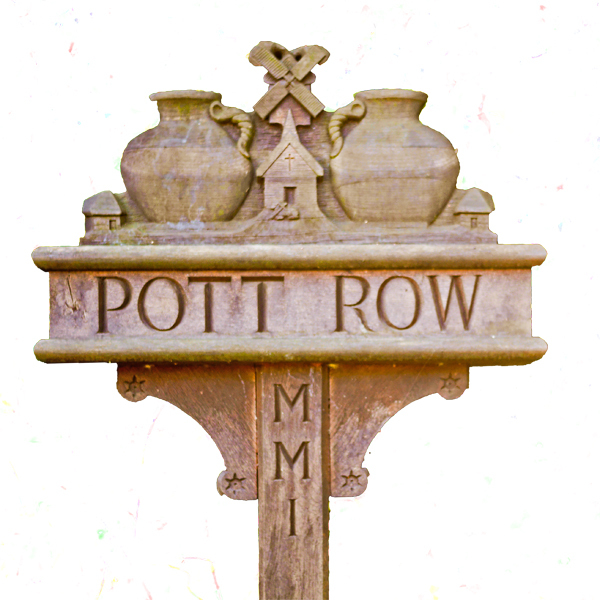 The church is dedicated to St.Botolph, who is thought to have visited the village in the seventh century. Most of the building dates from the thirteenth to fifteenth centuries. However it has been maintained and modified throughout the centuries to serve the needs of village people in each age. During the Late Saxon period Grimston was one of a number of places where a rural pottery industry producing Thetford ware grew up in the early 11th century. Grimston continued to be an important pottery production site into the 12th century, producing Early Medieval ware. 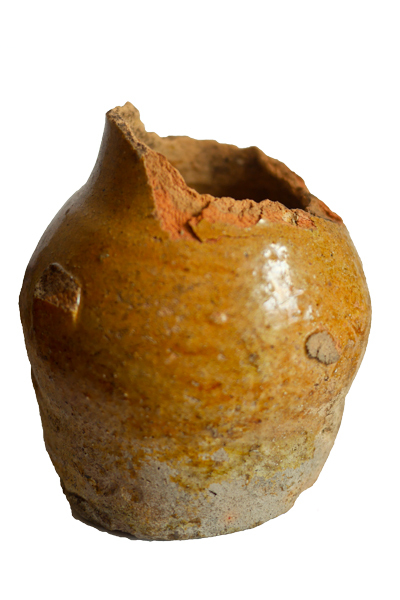 The earliest evidence for pottery production in the parish comes from the fields in between Grimston and Pott Row, where an early 12th century pottery kiln has been excavated. The pot opposite is typical Grimston ware with its characteristic lead glaze. This is a drinking vessal and would have looked, when complete, a little like a small milk jug. The nib on the left is what remains of the handle and the spout would have been on the right. It comfortably fits in one hand. It is 14th century and was found on Leziate Fen in an area where there was peat cutting at that time. Nearer to date, another key feature of the village is the Clock Tower at the junction with the Massingham Road. It is Grade II listed and was erected in 1897 to mark Queen Victoria's Diamond Jubilee. The photo. is set about 1910 and although the road has changed quite a bit, the clock remains, telling the time. 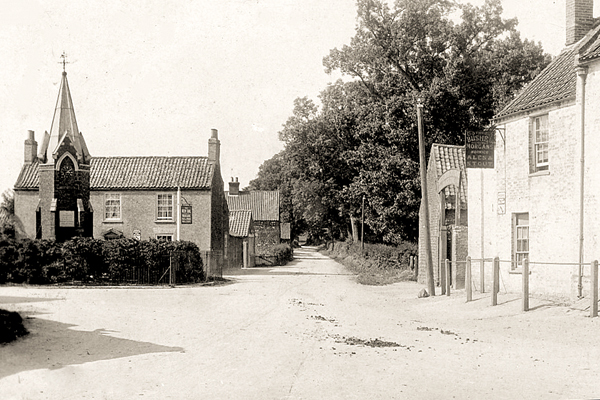 The pub on the left is where the shop and post office are now and just down the Congham Road, straight ahead, is the Medical Centre. There are lots of activities offered in the community covering a whole range of ages and talents – from Little Sunshines Pre-school, Mother & Toddlers, Scouts, Cubs and Beavers, to Greenfingers, WI, Art Group, Bowls, Book Club, Fourvilles amateur dramatics, and to Good Companions for the elderly. There is also a great group of Bell Ringers. You can read more of them here. There are always plenty of activities for all ages to join.